This sauce makes good on its bold promise, but that comes at the expense of a balance between some of the other more nuanced flavors that don't get a chance to make their mark. 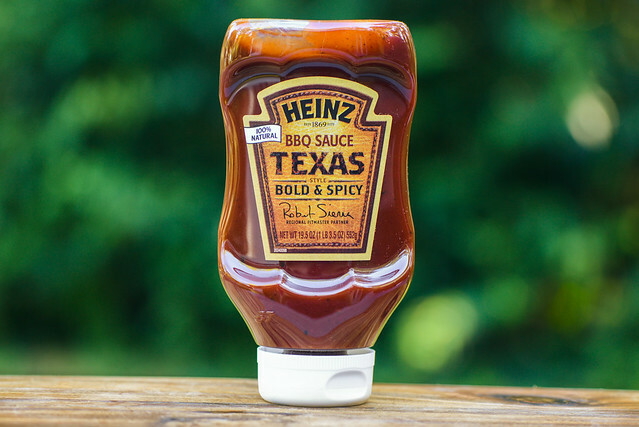 For how ubiquitous Heinz Ketchup is as a base for so many barbecue sauces, the company itself has never been a known much for their own barbecue sauce. Looking to change that, they released a line of five different sauces earlier this year and tapped top pitmasters across the country to create each regionally unique variation. 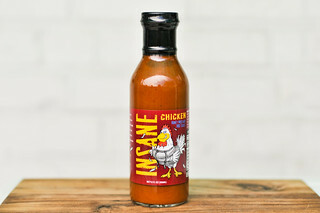 This particular bottles goes in a 'bold and spicy' Texas direction with Robert Sierra of the S&S Pit Crew out of San Marcos, Texas getting the nod to develop the recipe. Robert founded his team back in 2003 and has since gone on to win competitions all over the country, including two Texas state titles. A strong smoky, acidic tomato aroma fills the nose on the initial whiff of the sauce. That deep tomato base has some sugary molasses that cuts the upfront acidity. Beyond this bold base, there's background notes of onion, garlic, and a slight mustard pungency. 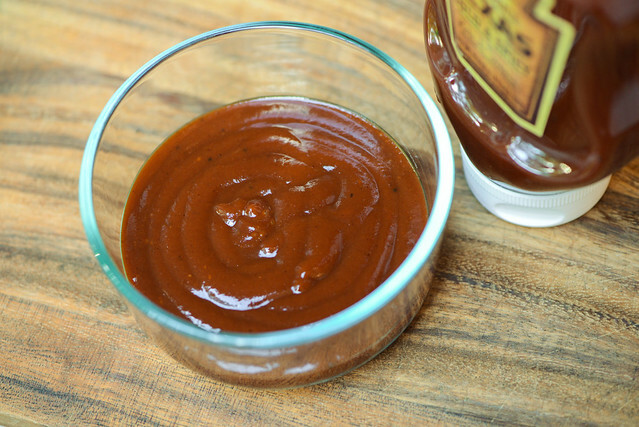 This maroon sauce is opaque with a semi-glossy appearance. You can see some large black pepper specs throughout, while the smaller, red spices are plentiful, but also more difficult to discern. Its consistancy is medium-thick—slightly thicker than ketchup—and it falls in a couple large globs off of a suspended at first. Then a couple slow drips release before the pour ceases, leaving a thick coating of sauce left clinging to the silverware. First taste of this sauce is a syrupy sweetness without much depth, then it quickly turns incredibly tart, almost to the point of being acrid. As the sweetness fades, the deep tomato flavor comes out followed by molasses, with both of these veering towards being more acidic than sweet in flavor. Like in the aroma, there's a background note of onion as well as a hearty smokiness that persists from almost the outset to finish. There's a hint of heat right at the end, but it's the vinegar rather than the pepper that leaves a mild tingle on the tongue. 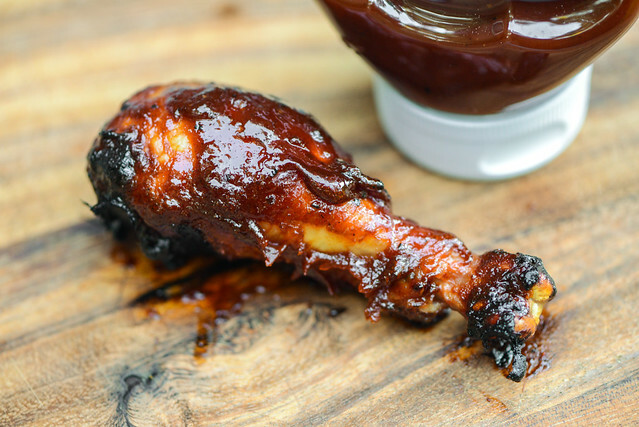 This sauce coated the chicken in a thick, splotchy manner. It cooked down in areas over direct heat, but not completely. This led to slightly higher than average burn off after moving the leg to direct heat. The flavor after being cooked tilted more towards sweet, while the tanginess really backed off. This created a different stamp of boldness than out of the jar. The enhanced sweetness overtook the more nuanced spices, but left the smokiness intact. I give credit to Heinz for creating regionally distinct sauces that at least taste like they're trying to be true to their origins and different than the other major supermarket brands. Unfortunately, I think they fell a bit short here with a sauce that reminded me more of KC Masterpiece or Jack Daniels than anything else. 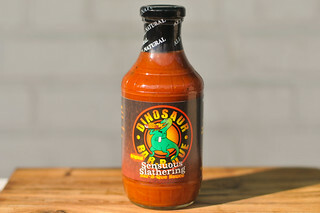 Part of the problem may be that Texas really doesn't have a well defined sauce style, and the tendency is to just make anything "Texas-style" more bold and powerful than other sauces, which is what happened here to fault—out of the jar it's a bit too acidic and then a bit too sweet after being cooked. This boldness comes at the price of drowning out the lesser ingredients, of which there are many that never get to make an appearance. So, all-in-all, I think your getting a fairly average supermarket barbecue sauce with Heinz Texas Bold & Spicy, and while I find these sauces a bit too over-the-top for my tastes, they certainly pack a lot of flavor into ribs, chicken, and the like and sell well for a reason.